× NEW!!! 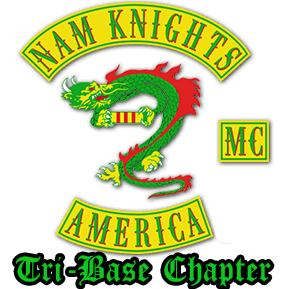 Nam Knights MC Member and Supporter Merchandise Available in the Online Store! Saturday, June 22, 2019 (rain date: June 23,2019) from 1:00 p.m. to 5:00 p.m.
$20.00 donation - includes food, beer, soda, and water. Live Music by Sugar Rush Rocks! The mission of the Nam Knights of America Motorcycle Club is to honor the memory of American Veterans and Police Officers who have lost their lives in the line of duty. Starting in May through September, the second Friday of every other month at American Legion Post 294 in Pemberton, we will be hosting Bike Night - rain or shine! Food specials — 50/50 — music — and more! May 10th, July 12th, and September 13th beginning at 6:00 p.m. Your financial support allows us to keep doing what we do. Donations recieved benefit local military, law enforcement, and their families in their time of need. The Chapter Store is open! Member shirts, NKL shirts, challenge coins, head plates, beads, supporter merchandise, and more!